The iconic moment in which Han Solo undergoes carbon freezing in “Star Wars Episode V: The Empire Strikes Back” is being duplicated as part of Disney Parks’ new “Carbon-Freeze Me” experience, developed specifically for the annual “Star Wars” event at Disney’s Hollywood Studios, beginning May 18, 2012. I also have posted photos and a full report here. Guests at Star Wars Weekends this year will be given the opportunity to step into a “Carbon Freezing Chamber,” located near The American Idol Experience in the theme park, and have their faces 3-D scanned using multiple cameras to create a 8-inch figurine depicting themselves frozen in carbonite. It also comes with a light-up wristband. The figurine will be shipped to fans’ houses after around four weeks, featuring the participant’s face instead of the likeness of Harrison Ford, stuck in that famous pose. The resulting figurine will be able to be hung on a wall. It’s part of Disney’s “D-Tech Me” line of personalized products. 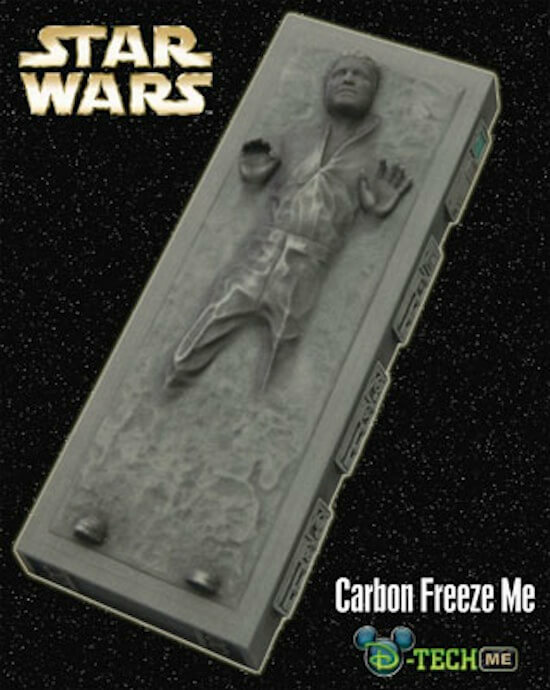 With thousands of fans attending Star Wars Weekends each year, the new “Carbon-Freeze Me” experience is sure to be a popular one. As such reservations are required and available to be made as of today by calling 407-WDW-TECH (407-939-8324). A call made to that line today took 13 minutes on hold before a Disney representative answered, who said the experience has been extremely popular so far and is likely to be fully booked within a few days. The cost to create a “carbonite” figurine featuring your own visage is $99.95 (plus tax and shipping). With tax, it comes to $106.45 and shipping amounts vary based on location. Additional figurines featuring the same image will be available for $74.95 each (plus tax and shipping). 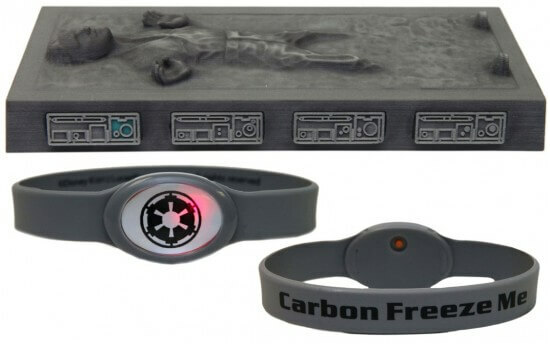 In addition, theme park admission is required for Disney’s Hollywood Studios to participate and no discounts apply toward the “Carbon-Freeze Me” purchase. Guests should arrive 10 minutes earlier than the reserved time and expect the whole process to take around 30 minutes, with more time allowed to strike multiple poses in order to choose that perfect “Han in agony” face (or any other zany facial expression). Faces must be clean and free of make-up. A few more restrictions worth noting are that children participating must be at least three years old and accompanied by an adult 18 years or older. When calling to book, a valid credit card number is required, though it won’t be charged until the experience takes place, at which point it is non-refundable. Cancellations must be made within 48 hours of the reserved time or a $25 cancellation fee will be assessed, with the same fee applying for no-shows. And yes, I have my own time booked for the new experience on opening day of Star Wars Weekends, which is May 18, 2012, continuing Fridays, Saturdays, and Sundays through June 10. May the Force be with me. Any idea on the size of the figurine??? As it says above (though a little buried in the text), the figurine will be 8 inches tall. lol i swear i went back to fund the size but didn’t see it! thanks for the help. I’m on hold for them now! When they say faces must be clean, are they referring to clean shaven or just clean as in not dirty, lol. Not shiny/sweaty and no make-up. I suppose it interferes with the 3D scanning process. I can promise the no makeup part but now the shiny/sweaty part, it is Florida after all. el tamaño es de 8 in. I am so incredibly jealous. If I only lived in FL, I would be there. any word if they will extend this beyond Star Wars weekends??? Will be there at the end of August/Beginning of September and would love to have this done! I had this done. It’s about 12″ high (random guess) and was so much fun. You can wear make-up and such. They give you a headband to remove hair from your face. This will run for 2 more days. However, they said this is a test run to see how popular it is so they might expand this in the future. I cannot wait to receive mine in the mail. We just got our figure in the mail and I was very disappointed. First off my husband and son were done at the same time yet only my sons has arrived so far. Secondly, I can’t tell by looking at it if it’s actually my son or my husbands face, the only reason that I know it is my sons is because his name was on the package. For $100 I would have liked for it to actually LOOK like one of my boys. I was very excited about this, but now I have serious buyers remorse. What a waste of $200. It’s a surprisingly perfect likeness of me. But I did think the child examples they had on display looked a little odd, especially when putting a kid’s face on a grown man’s body. I’ll be interested to find out if your husband’s looks better. thank you for the information…I’ll try these..